What makes these chocolate muffins so unique is the Ricotta Cheese. Ricotta Cheese is a sweet, moist and grainy, soft textured Italian cheese that gives these Chocolate Ricotta Muffins a moist and dense texture. Add to that a healthy dose of unsweetened cocoa powder and chocolate chips, and you have a terrific tasting muffin that takes hardly any time to make. A few notes on ingredients. Ricotta (pronounced "rih-KAHT-tuh") means "recooked", and is a rich Italian cheese that used to be made from the whey (watery residue from making other cheeses, like mozzarella) that is cooked to produce a mild, milky and nutty flavored white cheese. It is very similar to our cottage cheese only it is very perishable. Keep this in mind when buying ricotta, as once you open the container it needs to be used within a few days. Ricotta comes in whole milk or part skim and you can use either one in this recipe. Calabro Ricotta is the brand I like as it doesn't contain preservatives. 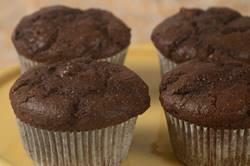 Unsweetened cocoa powder gives these muffins their wonderful chocolate flavor. I like to use Dutch-processed unsweetened cocoa powder (Valrhona is my favorite brand) as it gives these muffins a mild chocolate flavor while, at the same time, coloring the batter a nice chocolate brown. For the chocolate chips you can use semi sweet, bittersweet, milk, white chocolate chips, or even butterscotch chips. You can even use a combination of different flavors if you like. Chocolate Ricotta Muffins: Preheat your oven to 350 degrees F (180 degrees C). Place the oven rack in the middle of the oven. Line 12 muffin cups with paper liners or spray the muffin cups with a non stick vegetable spray. In a medium sized bowl, whisk the eggs. Add the ricotta cheese and whisk to combine. Then whisk in the sugar, milk, vanilla extract, and melted butter. In a large mixing bowl, whisk together the flour, cocoa powder, baking powder, baking soda, and salt. Stir in the chocolate chips. Add the ricotta mixture to the flour mixture. Stir just until combined. Do not over mix this batter or the muffins will be tough when baked. Divide the batter amongst the muffin cups using two spoons or an ice cream scoop. Place in the oven and bake about 18 - 20 minutes or until set and a toothpick inserted in the center of a muffin comes out with a few moist crumbs (the tops of the muffins will have cracks). Remove from oven and place on a wire rack to cool. Can be stored at room temperature or in the refrigerator for 2 to 3 days. They can also be frozen.